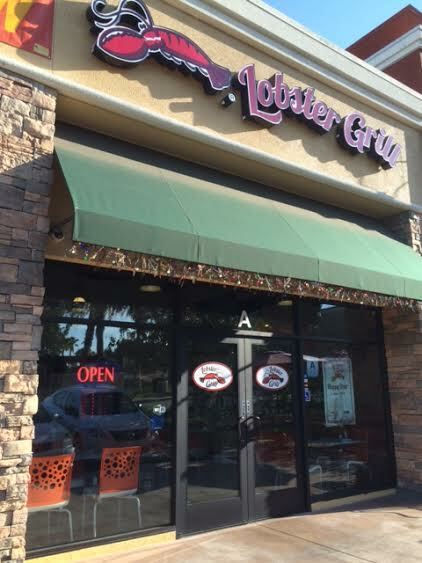 I’ve passed by Lobster Grill when seeing movies at the Harkins 18 but only visited recently after a positive comment on FB from reader David Saw about the lobster rolls. As a lobster roll fan, I figured I should give the place a try. On my first visit, though, I went with something different. 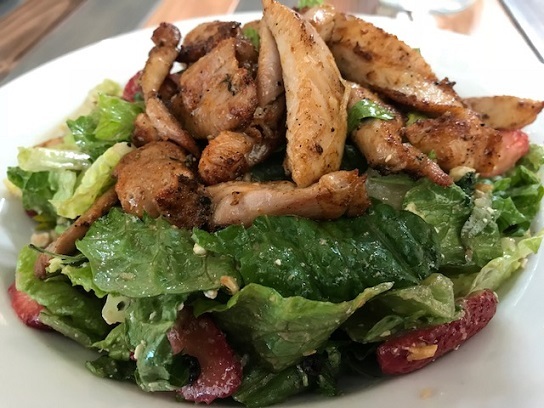 The menu is much like Pacific Fish Grill elsewhere in town, with seafood plates and sides, and the style is fast-casual, bringing the cost down. 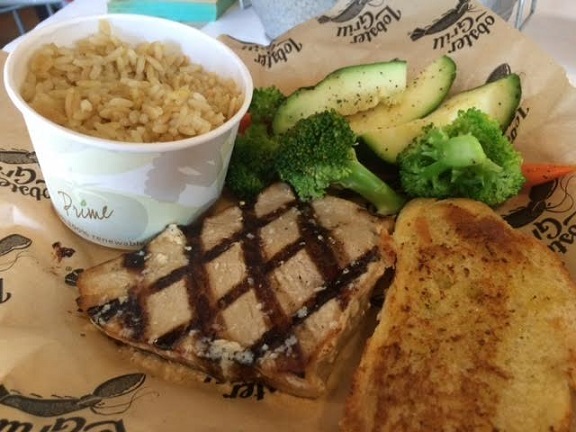 So I ordered grilled swordfish ($12) with garlic butter sauce, rice pilaf and steamed vegetables; it comes with a thin piece of garlic toast. 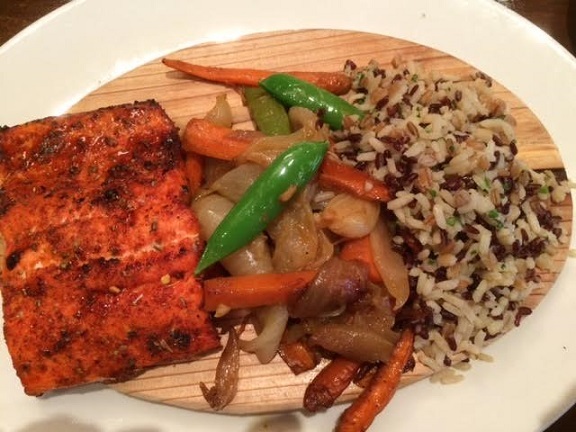 Pretty good, and on a third visit my order was very similar, only with mahi mahi ($12) instead. I didn’t like it as much and the vegetables are kind of boring. 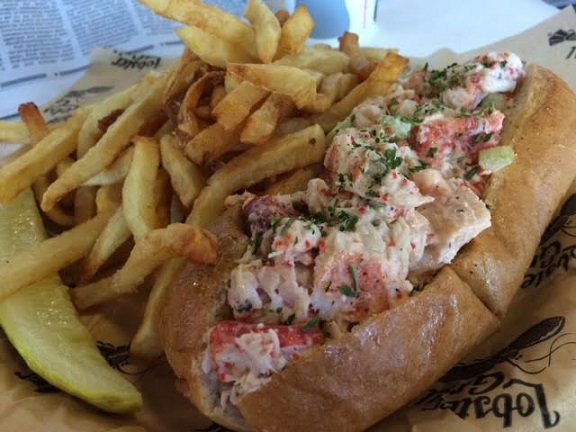 Now, how about that lobster roll? That came on my second visit: the sandwich, New England style, with fries ($11). This is a cold roll with a kind of lobster salad, on a warm piece of folded bread that will remind you of Sizzler’s “Texas toast.” I prefer the Connecticut style of lobster roll, which is served warm, but this was a good New England roll, with a generous helping of lobster. The fries were tasty too. 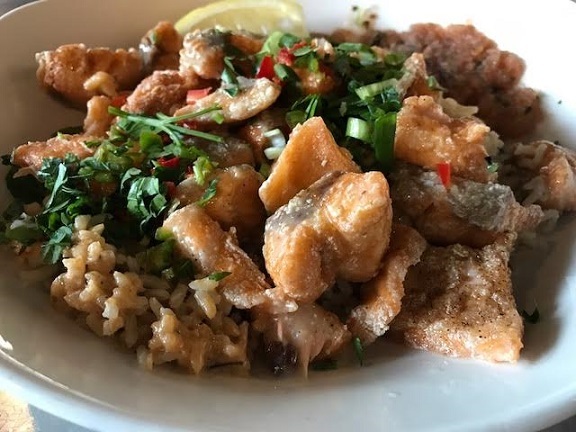 The menu is slightly more seafood-intense than the local competitors, with clams, mussels and oysters on the half-shell, and with Cajun buckets ($28 to $35). 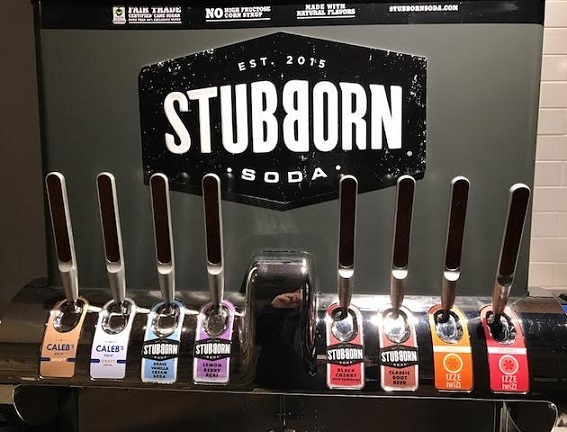 That said, I’m a little wary of ordering oysters from a place that doesn’t really specialize in them, and for the same reason I’ve shied away from crab legs and such. 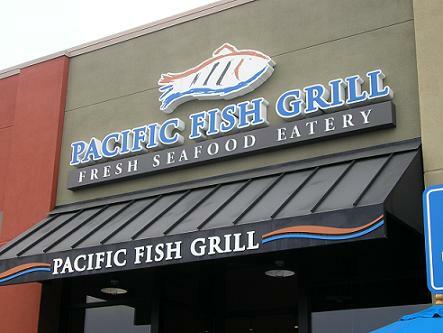 Overall, I prefer Pacific Fish Grill. 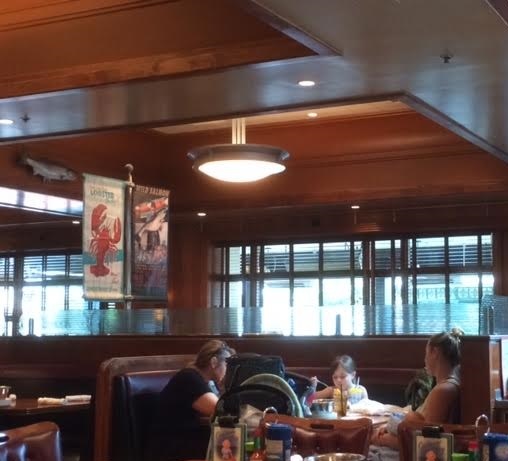 But Lobster Grill is all right for the basics, and the parking is easier than at the Shoppes, where Pac Fish is. 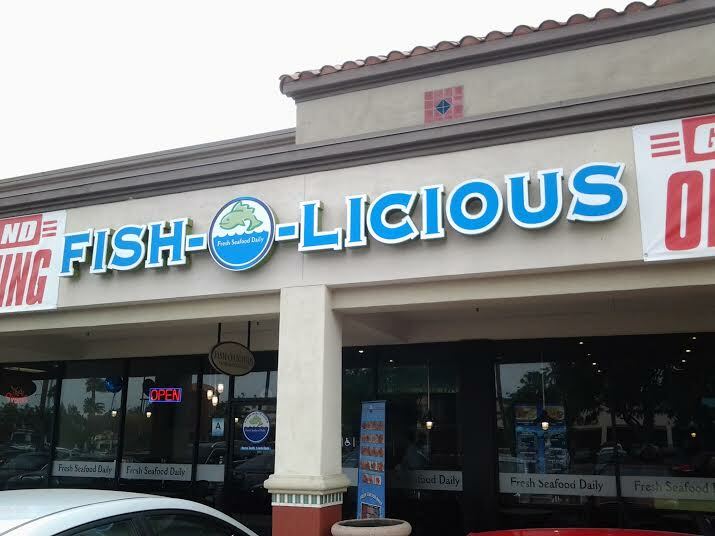 Candidly, I don’t remember much about Fish-O-Licious, so I’m not sure where it rates in the Chino Hills spectrum (as opposed to the Chino Spectrum Marketplace) of cheap-ish seafood joints. 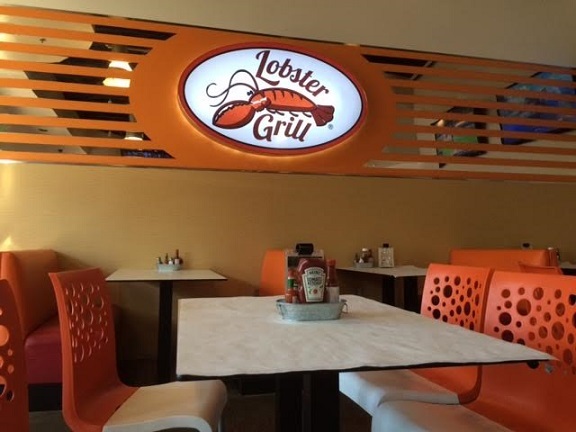 The Lobster Grill interior is pleasant enough, orange plastic seats and paper-covered tables, although lately I’ve just been happy for the air conditioning. Reader Bill Velto raved to me about the Supreme Plate or I might never have learned it existed. Even knowing where it was, I couldn’t find it at first; the only sign is painted on the door and window. 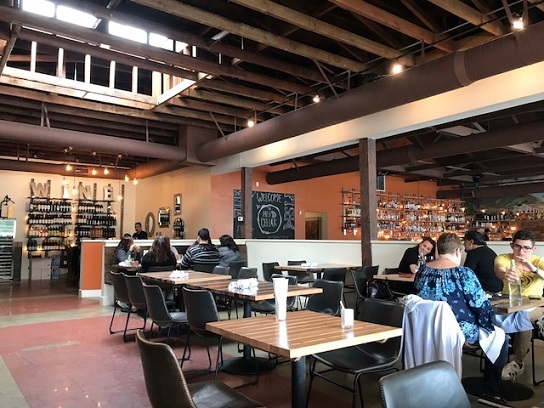 The interior is mostly nondescript too: stackable chairs, black vinyl tablecloths, minimal decoration other than an excellent mural in street art style. 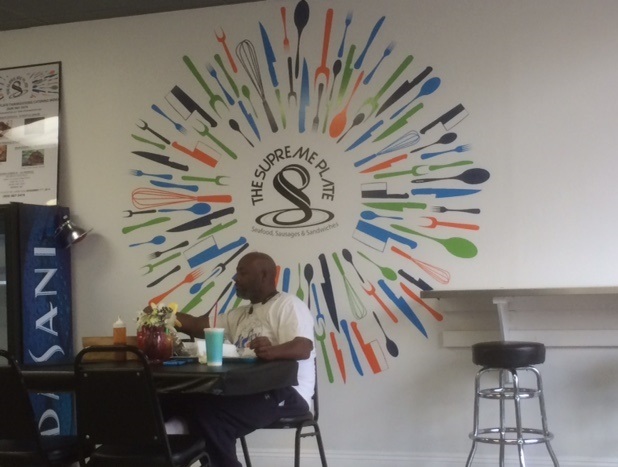 The staff, though, is gregarious, with Deep South accents. 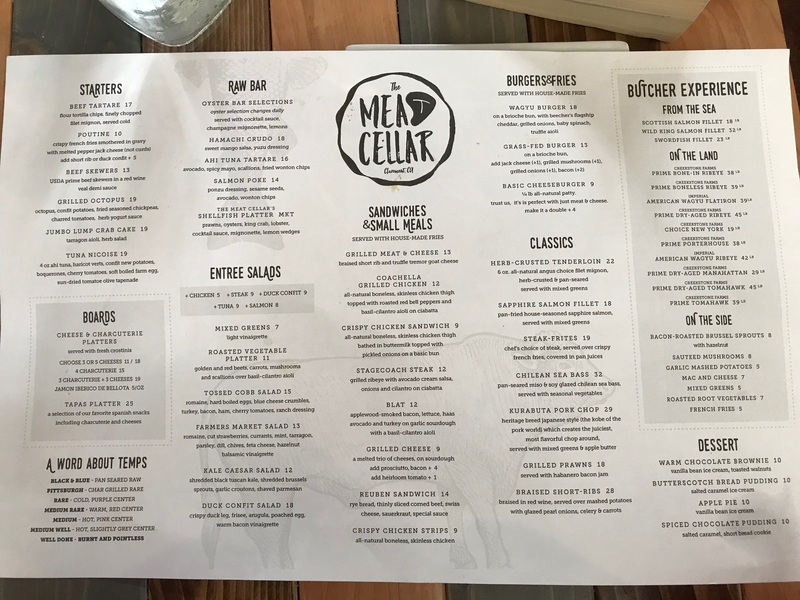 The menu is almost entirely seafood: plates and po’ boy sandwiches featuring shrimp, oysters, crab, catfish and red snapper. 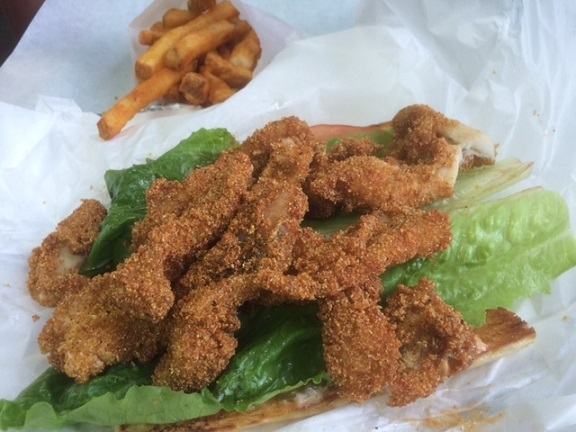 My first visit, I got a catfish po’ boy (pictured below) with a side of Cajun fries and a soda for $10. Good stuff, although my preference is for a filet, not a series of nuggets. I returned for dinner one night and brought a friend. 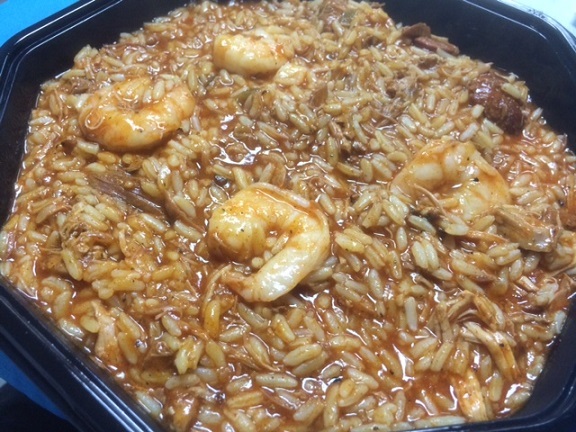 I got the jambalaya ($11, pictured below middle), loaded with chicken, sausage, shrimp and more, and half of which I took home for a second meal. 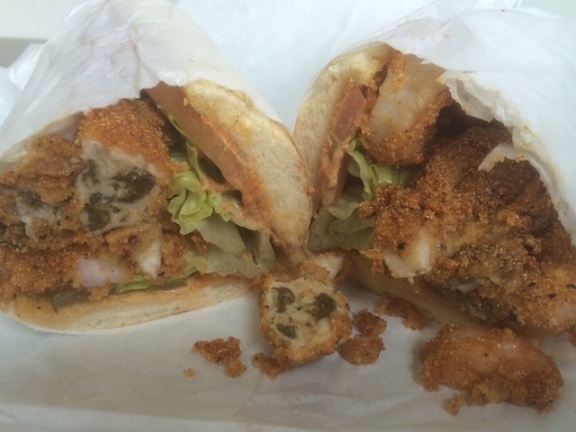 He got a shrimp and oyster po’ boy ($13). “You pay more, but you get more,” he said, taking home half his sandwich. “I was going to offer you half, but it was too good. I want it for lunch tomorrow.” Well, he was honest. The oysters looked so good falling out of his sandwich, I went back for my own shrimp and oyster po’ boy (pictured at bottom). Those were some mighty oysters. The staff is small and my sandwich took a half-hour to arrive during lunch hour, as a few people were ahead of me; you might call ahead or visit at an off-peak time. I’ll keep going back. 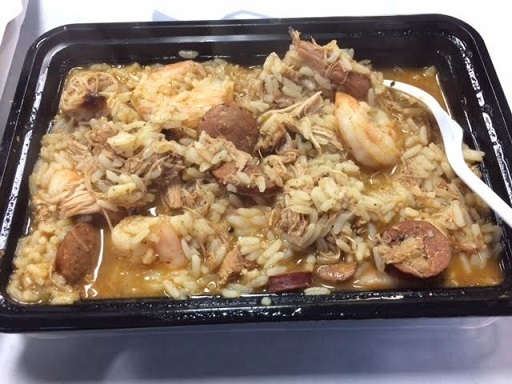 They’ve got sides like cheesy grits and sausage, hush puppies, red beans and rice, and more, as well as gumbo on weekends and oxtails with rice. I hope this place succeeds — there are always customers, a good sign, and it currently has a five-star rating on Yelp — because it’s a good addition to the area. The Supreme Plate is supreme. Update April 2016: I come here all the time. 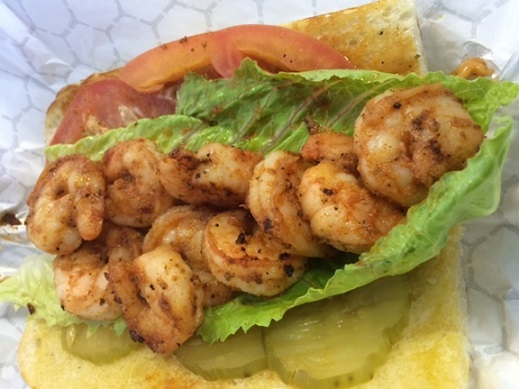 Here are two more photos: gumbo and grilled shrimp po’boy. They do not skimp on the shrimp. The collard greens here are good too. 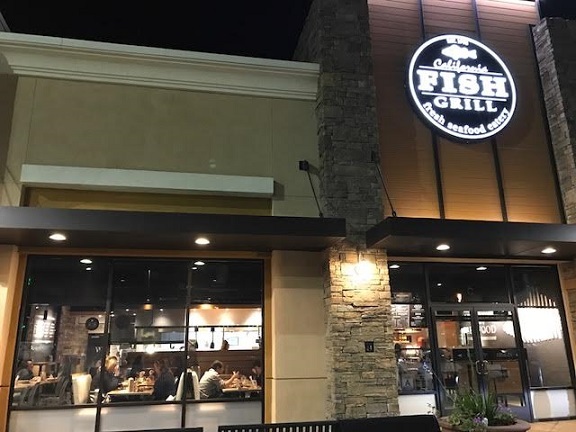 Chino Hills has Pacific Fish Grill at the Shoppes, an informal seafood spot about which I posted in 2009. One wishes there were more such places in the Inland Valley. 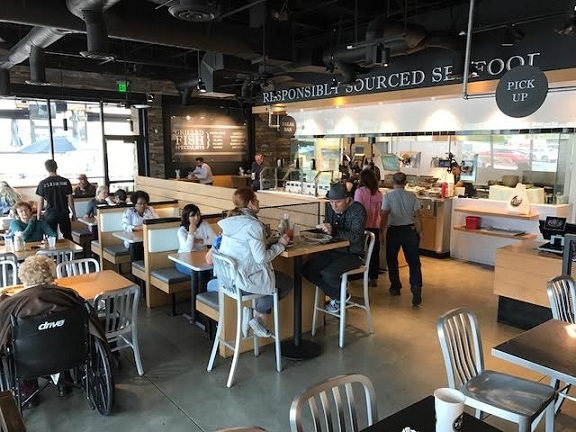 Well, since December there’s been a second, and it’s also in Chino Hills: Fish-O-Licious. 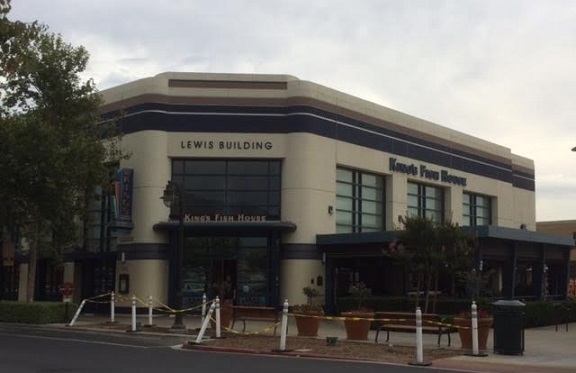 It’s a wannabe chain with one other location, in Commerce. Some of the menu offerings are fried, others are grilled. And before you wonder if this is a gussied-up H. Salt, the motto is “Fresh Seafood Daily.” I had lunch there with a friend recently. I had the special No. 3 ($10, bottom), a plate of sole with a slightly sweet sauce with pineapple and peppers, as well as an above-average slaw, a roll and, in a pleasant surprise, a soda. Not a bad price, and the food was very good. 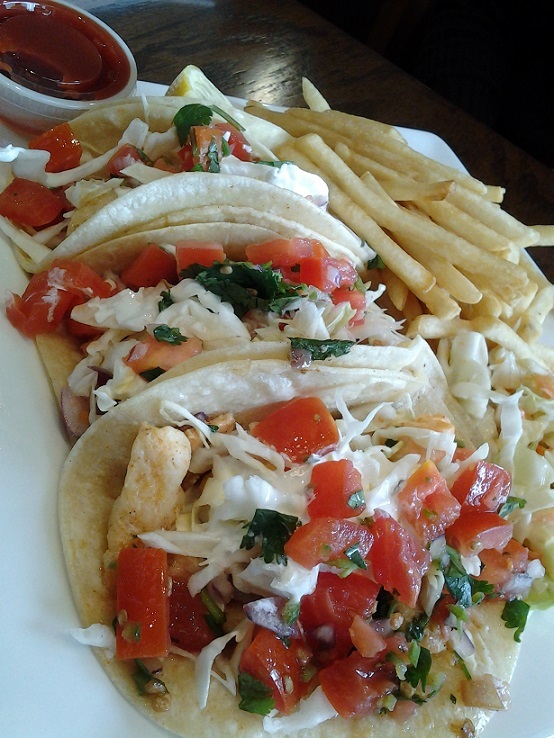 My friend had the three fish taco plate ($8, below), which came with fries. She liked the tacos but thought tortilla chips would be a better side than fries. 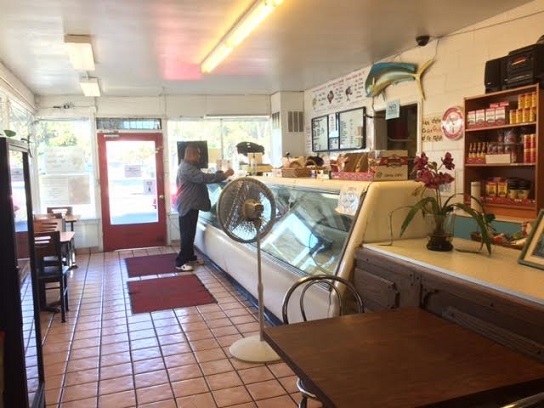 They have sole, salmon, catfish, halibut, shrimp and scallops, as well as chicken (for those who hate fish, I guess) and chowder. 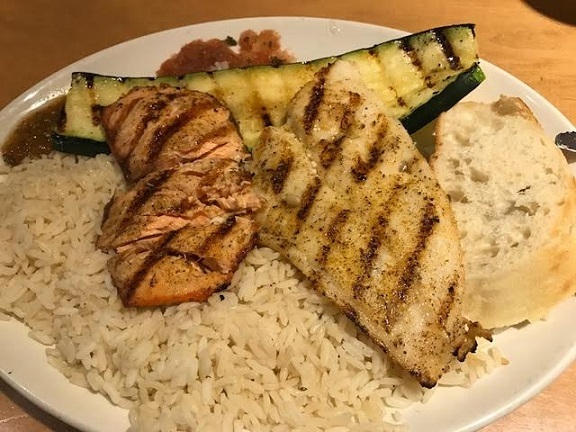 My friend’s comment was that it’s good to have another healthy option but that it’s pretty similar to Pacific Fish Grill. My comment is, I like it, but why can’t it be in a different city? Chino Hills has all the fun. 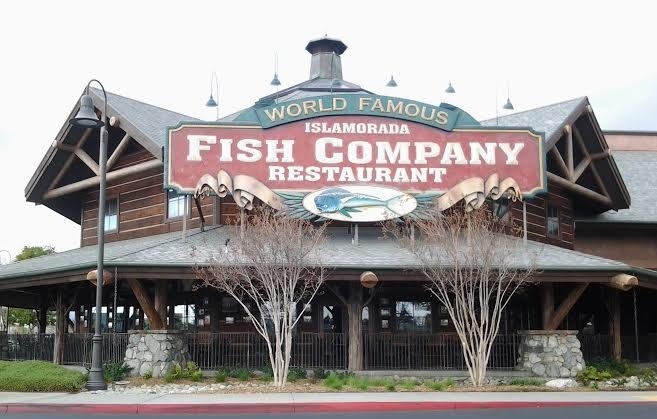 Islamorada is the in-store restaurant at the huntin’, fishin’ and campin’ paradise, Bass Pro Shops in Rancho Cucamonga’s Victoria Gardens, as mentioned in today’s column. While writing that piece, incidentally, my spellcheck suggested that I replace “Islamorada” with “slumlords”; I declined. 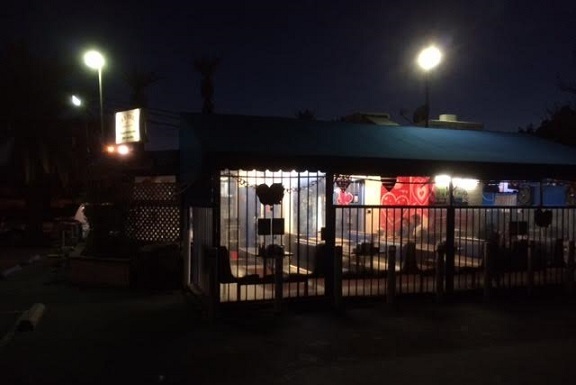 You can access the restaurant from the parking lot or from the store. On Monday about 7:30, the dining room was said to be full, so a friend and I ate in the lounge, where they have full service. Even the bar is impressive, with a lot of wood, an aquatic motif and, behind the bar, an aquarium some six feet high that wrapped around the bar. It made for a great view. A duo performed until about 7:45, a woman singing and a man on keyboards. First full number we heard: “I Will Survive.” I pretended the lyrics were being sung from the point of view of a tenacious fish or defiant deer. 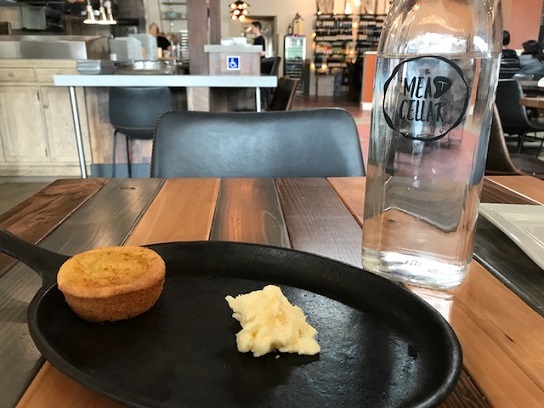 The server brought out a small loaf of tasty, sugar-topped bread. 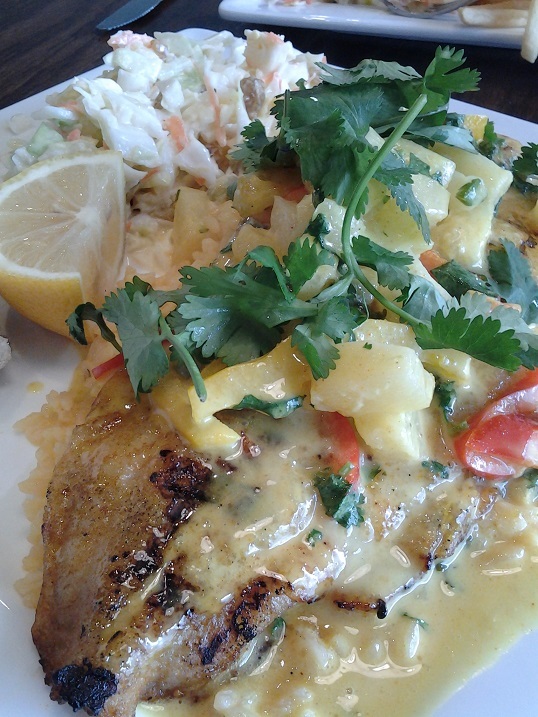 The cajun pineapple tilapia came lightly blackened, with a sort of chutney on top. I liked it. 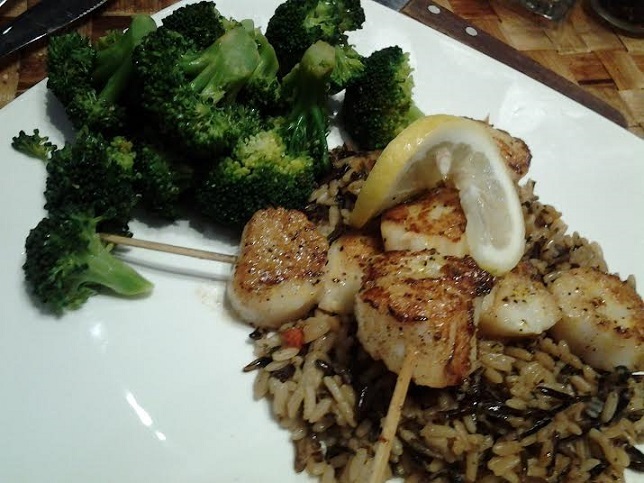 The grilled scallops (below) were even better. The rice was OK, the fries were above average and the vegetables slightly mushy. Service was attentive. 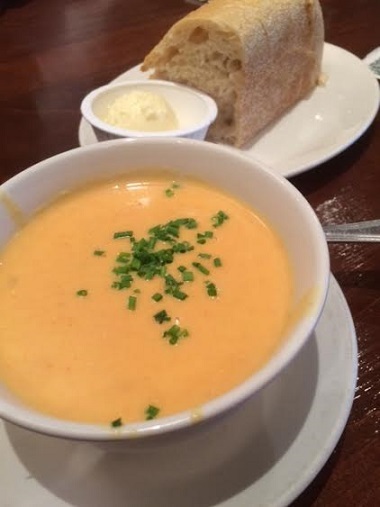 Overall, a better meal than expected, or even necessary. While not as good as Market Broiler in Ontario or Kings Fish House at the other end of Victoria Gardens, I’d go back. 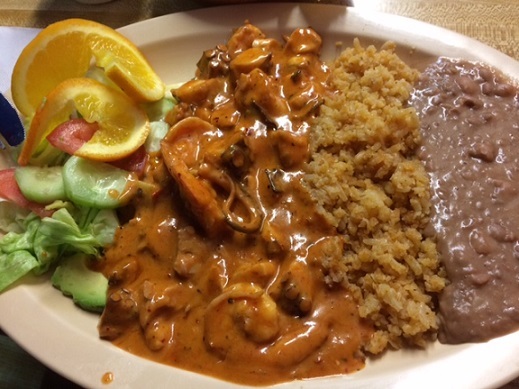 * InJanuary 2014, I did go back, for probably my fourth meal, and to take the accompanying photos. Got the scallops again ($20). 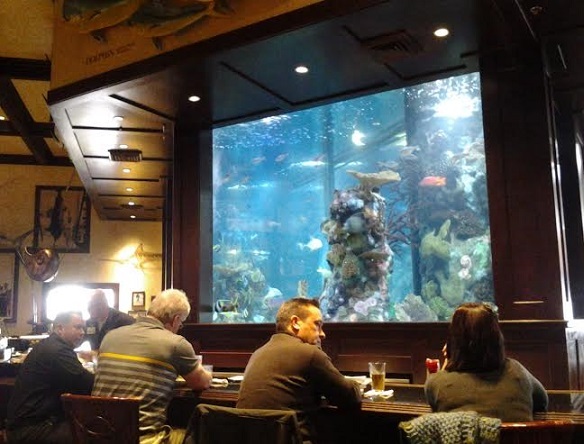 Islamorada remains a really good restaurant, and the bar, and the round dining room with replicas of swordfish and other aquatic life suspended from the very high ceiling, are among the more spectacular interiors in the Inland Valley. 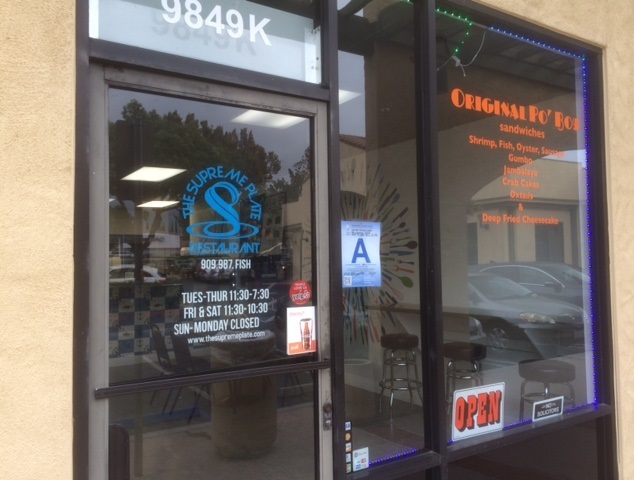 With time to kill before Monday’s Pomona council meeting, I thought I’d try a south Pomona taqueria for dinner. 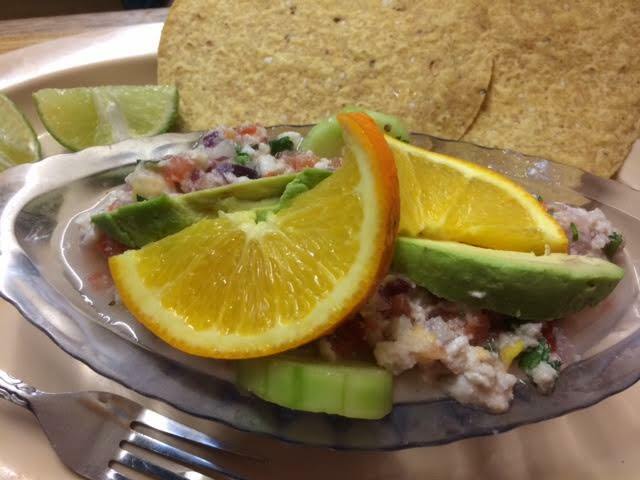 But once I hit downtown I swung by the Pomona Fish Market, a take-out place at Third and Park streets. Not to worry, the interior has seating for eight, plus an outdoor patio. 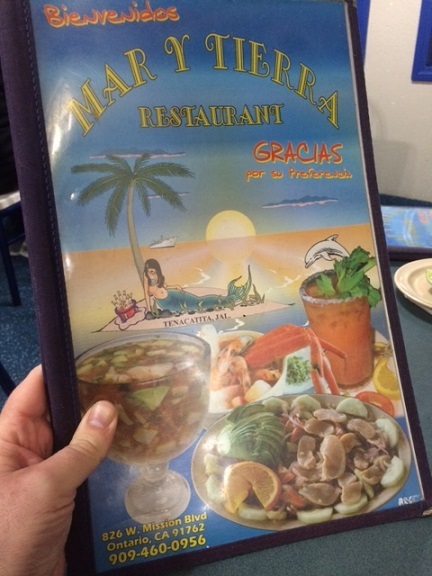 My order was taken by a woman behind the supermarket-style display case, which was about half-stocked with fish on ice. 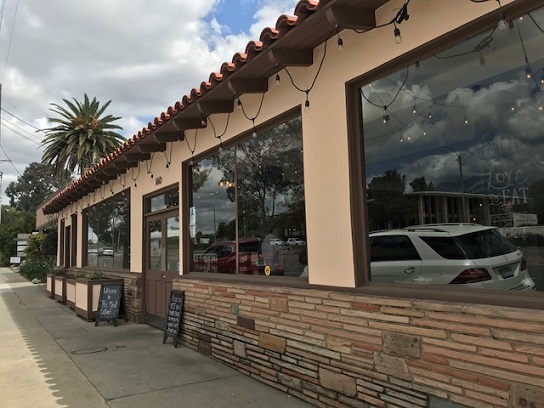 There’s a limited menu of fried fish plates, such as sole, sand dabs, oysters and shrimp, served with fries and cole slaw and all priced under $7, as well as a couple of sandwiches. I got the catfish plate ($5.95). 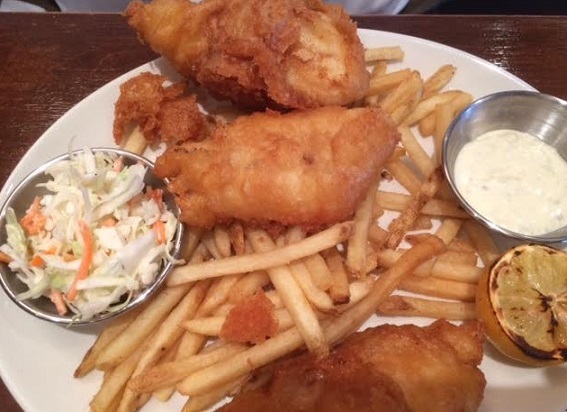 Well, the slaw was a bit dry, but the fries were acceptable and the fish, fried in a light coating of (I think) flour, wasn’t bad at all. I’m not a fried fish guy, but if I were, I’d probably go again. The food’s a darn sight better than Long John Silver’s. 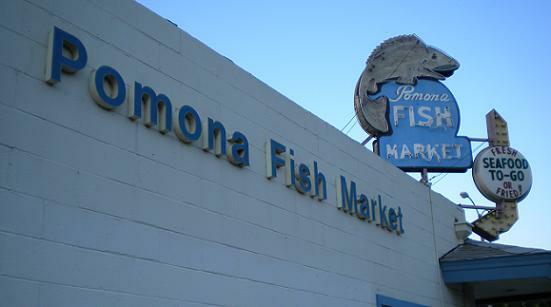 The Fish Market has been in Pomona for decades. In researching city character Urban Ziegler on Progress-Bulletin microfilm last summer at the library, I found an April 1, 1937 ad for the market, meaning it’s at least 70 years old. Prices included haddie, 35 cents a pound; cod, 20 cents a pound; sea bass, 29 cents a pound; and halibut, 25 cents a pound. 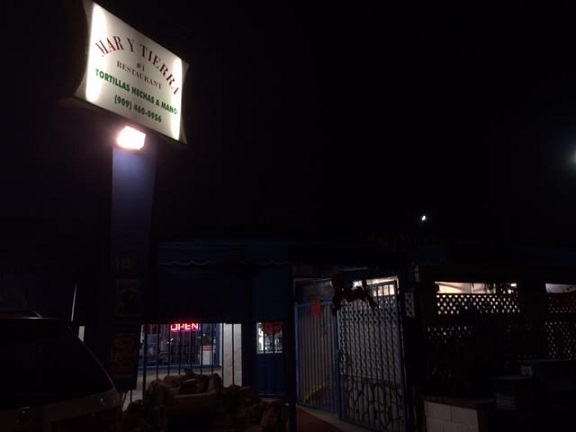 The ad boasted: “An Exclusive Fish Market is the Best Place to Buy Fish.” Oh, that snooty Pomona. Update, July 2016: I had dinner here before yet another council meeting. 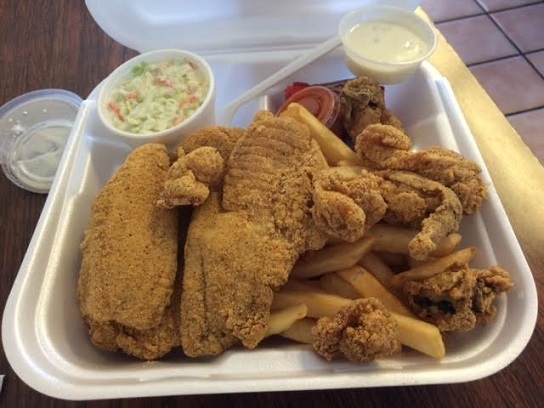 A combo of four pieces of fish (tilapia was my choice), three oysters, three shrimp, fries and slaw, was $8.70, plus another buck for a canned soda. Again, fried fish isn’t my favorite, but this was acceptable, and more food than I needed.